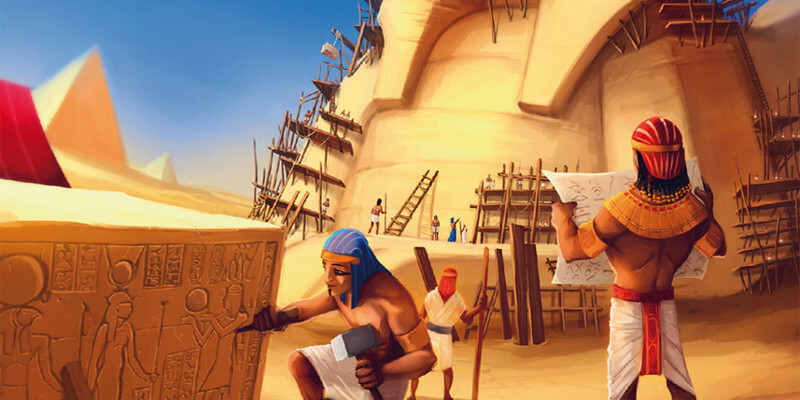 The Builders: Antiquity is an upgrade of the original game, with additional mechanisms. If you have never played The Builders: Middle Ages, we recommend you to start by learning this game first, and then to try the new one! Purchase a slave: a slave is like any other worker, except that you don't have to pay wages when you use him/her. But it will cost you a victory point, that you can recover if you "free" your slave before the end of the game. Buy a tool: once bought, you can match a tool to a worker to boost its capacities. Take out a loan: a loan brings you 10 coins. Then you need to repay it for a cost of 15 coins before the end of the game or lose 2 victory points. Educate a worker: you can upgrade a worker by placing a "transparent card" on it, and boost its capacities. If you already know "The Builders: Middle-Age", you should definitely try this upgraded version of the game! The investments brings only a little more complexity for a lot of new possibilities and strategies! This adaptation for The Builders: Antiquity has been developed by Vincent Toper using BGA Studio. This game is a Premium game: it means that you need to be a Premium member to create new tables for this game (then any player can join your tables). BGA would like to thank the game designer Fred Henry and the game publisher Bombyx for making it possible to have this game online on BGA. Looks good. Will the rules be posted at some point? Gandon wrote: Looks good. Will the rules be posted at some point? i added links to the english and french rules from the publisher website to the game page. i didn't get any option to repay the loan during the final scoring. it's only 1vp difference, but i thought i'd have one final chance to pay back the loan. i know in another game, i was able to free a prisoner after the game end was triggered. Is it just me or rhere is no easy way to tell order of players.